YOUR FREE GUIDE IS NOW ON ITS WAY TO YOU! IF IT DOESN'T ARRIVE PRONTO, PLEASE CHECK YOUR SPAM FOLDER AS IT MAY HAVE GOT LOST IN THERE! A huge part of Living With Vitality is honouring you and your body and it took me over 15 years to figure out the formula. You see, I kept focussing on food and exercise and I was going around in vicious circles. You name it, I tried every diet under the sun and I failed miserably. Until I worked on my mindset and discovered 5 secrets to body confidence, I was stuck in a pattern of emotional eating and punishing myself at the gym. Click 'PLAY' below to hear more! 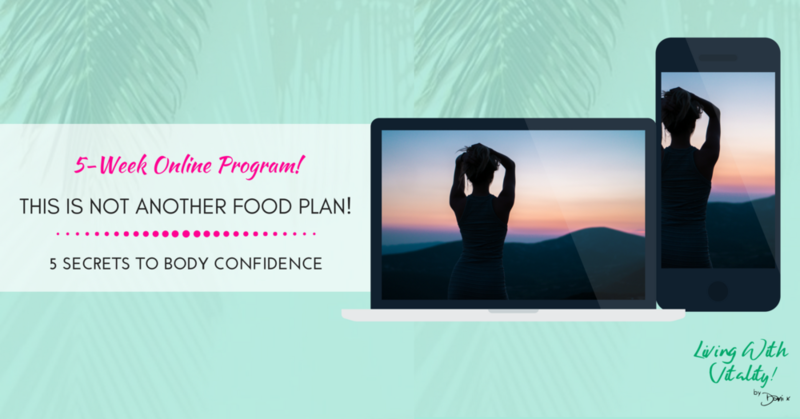 Hit Play To Hear More About This Exclusive 5-Week Online Program To Kick Emotional Eating To The Curb! FROM RESTRICTION + MISERY TO BODY CONFIDENCE IN 5 EASY WEEKS! You saw right! This is NOT another food plan. Woohoo!! Hey you! Welcome to my hot little Online Program that contains my top 5 secrets to waking up with Vitality and feeling confident in your skin. The secrets to lasting change begin way before any food reaches your lips, which is very simply, why I don't tell you what to eat. Yep! You heard right. Instead, these secrets allow you to effortlessly stop the idle snacking and find freedom from food. You found yourself on this page which tells me you are sick to death of diet after diet and what you 'should' and shouldn't eat. Ugh! I don't blame you for being over it. You see, I noticed a huuuuge disconnect between the nutrition world and the mindset world. In the magical area in between is where you'll find me and the secrets to body confidence and a life that sets your soul on fire starting with YOU! For less than $30 a week, you can have these secrets too! dani, give me those secrets! Living With Vitality bridges the gap between where you are now and where you want to be. My ethos: 'I choose to feel good' has become my inner compass to guide ALL of my decisions and as a result, I kicked scrutiny, restriction and emotional eating to the kerb and replaced it with a carefree, happy and sustainable way of living and eating, empowered in loving what I see in the mirror. THIS IS NOT ANOTHER FOOD PLAN! Is an introduction to Living With Vitality and you won't find one recipe, food plan or daily calorie count here. Instead, this 5-week fun, easy to implement online program invites you into my 5 secrets to delve deeper - to get to know WHY you do the things you do AND better still; gives you the tools to stop those moments when you blindly reach for food to console a crappy day or feel out of control, stressed or overwhelmed. PLUS - A Daily Meditation To Get You The Results You Want.. And You'll Stay There! All for less than $30 per week for 5 weeks! I've heard enough, I'm in! MEET SOME AMAZING WOMEN WHO ARE NOW LIVING WITH VITALITY AND HAVE BODY CONFIDENCE! click here to buy your program now! Fuelled by wanting to know more about why die-hard habits become so engrained in our programming; Dani trained in the area of NLP and Time Line Therapy ® to facilitate women's journeys' to peel back the layers to reveal who they always were deep down at their core. Having gone through those times, Dani understands that the last thing a woman wants is to go on yet another diet with an expiry date because it's just not sustainable. It took many years of making the same mistakes to be where she is now, serving so many amazing women who have created a healthy lifestyle from their unique blueprint to what works for them. In helping women to find freedom in Living With Vitality!, Dani steps well away from any kind of food plan or diet. Instead, she has created a system that connects your desires and intentions to make the very best choices for yourself, full of freedom to live your life on your terms. NOW IT'S YOUR TIME TO THRIVE! IT'S TIME FOR YOU TO STEP OUT WITH BODY CONFIDENCE! Unlock the secrets to Living With Vitality, wake up with energy and love what you see in the mirror. Yours for $147. See you there! Yes! I cannot wait to see you unlocking the 5 secrets to body confidence and aligning the choices you make to feeling good. Welcome to YOU! The woman you always were deep down. She's ready!